See also Chapter 3.3 of Smashing Physics. In a way, I am quite impressed by the Royal Academy of Engineering. They have managed to speak very clearly in response to some difficult questions from our new political masters. What they have to say, however, is pretty depressing. 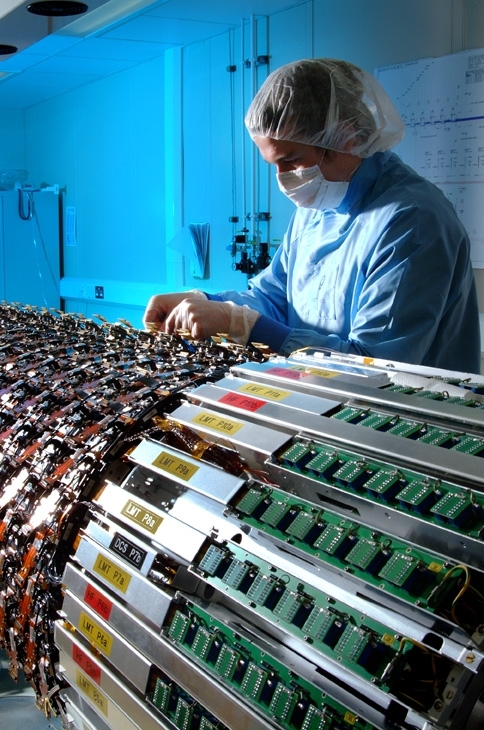 ATLAS barrel silicon detector, built in the UK. Photo credit STFC. This may make sense. I see real deficiencies in the way the UK trains and treats people of who are technically skilled, compared to some of our competitors (I’m thinking particularly of Germany and France, where I have some direct experience). I have a feeling that we place too much emphasis on marketing and management, as though these have value independent of the things they are marketing or managing. But this is not much more than a gut feeling, and unfortunately the RAEng document doesn’t provide any evidence to bolster my prejudice. A missed opportunity, assuming they have such evidence. Naively I would have thought that this “foreseeable future” stuff was precisely where private-sector research should take the lead, rather than the public sector, since foreseeable impact presumably means there’s a market. But actually maybe the public sector is better at this than the private sector. Perhaps a command economy is actually the way forward. They’re probably right. Whitehall, and governments in general, are notoriously good at spotting the next transformative technology wave, of course. I mean, fancy doing stuff overseas! What were we thinking…? And I’m sure the many students we attract into physics will be distressed to hear about the lower contribution to the “intellectual infrastructure” of the UK that comes from working with foreigners! I am dismayed. I thought engineering and I lived in a sunny symbiosis, but it turns out it always hated me! I am not saying that science and engineering should always present a united front to government, demanding more money in unison. We should debate priorities, and we should accept that economic impact is important. But this document, with its focus on the short term foreseeable impact utterly misses the point that the long term and unpredictable results of research are often the big wins. It’s a cliche, but if we had followed this recipe for the past centuries we’d now have excellent candles but no light bulbs. It’s also desperately sad that the RAEng lashes out at its nearest neighbours. The engineering challenges of the LHC are immense. I always wondered why, we (the UK) do so well at driving the physics at CERN, but are weak at exploiting the engineering opportunities. Maybe now I know – looks like the last thing the RAEng would do is use the challenges posed by particle physics as part of their vision. Anyway, I am not going to start arguing against engineering research. The fraction of GDP we spend on science and engineering is below average, yet brings a huge return. The short term saving obtained by cutting it would have a negligible impact on the deficit. But government funding for research into how nature works, for its own sake, will never be replaced by commercial research. Removing it would close the pipeline of serendipitous breakthroughs and condemn science, engineering and the UK economy to a long-term decline. I can only hope that the short-sighted attitude of the RAEng is not representative of engineers as a whole. Since I accuse the RAEng document of being evidence-free, here’s some evidence about the benefits of particle physics in particular, and blue-skies research in general. This entry was posted in Particle Physics, Politics, Science, Science Policy and tagged Smashing Physics, STFC. Bookmark the permalink. 27 Responses to Engineering a Decline? OK, I do agree with the main gist of your criticism and the pararaph about particle physics is really crappy and unnecessary. But having worked in astronomy, mechanical engineering and basic technology development for astronomy, I have to add a few comments to what’s been said here. Science and engineering don’t stand apart. Our fundamental discoveries are made with the help of equipment designed and built by diligent engineers who care deeply about science and get little credit for their work. Many of them do the kind of work that private industry would probably not invest in. Even more, work that we wouldn’t *want* done in industry. The danger of relying on industry for technology development is illustrated by the problems with procuring large format IR detectors in recent years. Astronomy and particle physics are niche markets that just aren’t profitable. So if funding to university engineering departments gets cut in favour of blue skies research, that will *also* affect us in the basic sciences. This is not an “either/or” situation, we have a stake in the engineering excellence at universities – and vice versa. In fact, engineering departments can form a crucial link between the basic sciences and industry, an interface that is usually pretty hard to navigate. Both basic and applied sciences will lose out with these funding cuts, that’s clear – rather than point the finger at each other, the disciplines would do well to sit down together and figure out how to maximise research output from the available resources together. Just to add I did not mean we should spend money on pure science, and not applied science. We need both….and if we really are in a position that we have to choose one or the other….well that seems pretty dire for the future to me. Sadly I don’t know a url for it….but I recall recently reading about a goverment commisioned report in the 1980’s that was deciding where the UK should invest money in to get the next “communications” breakthrough. Of course they had lots of ideas….but the world wide web was not mentioned. This illustrated nicely that just taking a list of applied science projects, although of course useful in its own right, is not always a good way to generate the next “big thing”. Derivatives themselves are a problem.It is nothing but glorified gambling and it is fueled by greed . Can we say that whatever that does not add to public purse is useless and to be discarded? Money is a means not an end . Knowledge in its pursuit improves the quality of human mind and standard of living as well. Unfortunately we seem to have a feeling that every thing must revolve around money,probably this is one of the reasons our not being able to advance much in Pure sciences. People seem to think there is a problem with derivatives. That term generally encompasses futures, options and swaps. Which of those is a (a) a problem or (b) implicated in the current financial crisis? Also, since financial services represent 31% of GDP, who do you want to pay for your science or engineering research if not that, bearing in mind that even that number includes the public sector, taxation of which does not bring in income to the public purse? Smartphones have also banished knobs by using touch screens. We need a SmartRAEng. An engineer working at CERN invented touch screens to reduce the number of knobs and dials in the SPS control room: http://cdsweb.cern.ch/record/1248908. If only there was a similar way to reduce the number of knobs at the RAEng. The CEO of RAEng is not the only member of this illustrious club to be on STFC Council, surely the Chair of STFC, Michael Sterling, is also a member. But then look at the Council compostions of MRC, EPSRC, NERC and compare with STFC. In other Research Councils the ratio of academics to others is roughly 2.5:1 in STFC it is 1:1. Can one suspect an agenda here? Financial Services,some of them given fancy names like ‘Derivatives’, are nothing but a scam and the amount of time and energy spent by the government may be better utilized for Science and Engineering and Technology in that order. Processes have taken precedence over essential functions of society, like for instance IT.This an anomaly. Why is that advancement in Science(pure) is next to nil in th 20th Century?I am not taking about technology and gadgets.We seem to be having the same basic theories in basic Sciences.Does this mean we have discovered whatever is there or is something wrong in our approach? What ‘time and energy’ do you think the government spends on ‘derivatives’? Attacking another field is usually counter productive. Its far better to go only with a positive message about one’s own field. Furthermore, their arguments about CERN and lack of impact were asinine. Is this something the community can make any effective fight against? Little is said of the huge contribution that fundamental discoveries in Physics and Maths makes to the international prestige of the UK. If the rest of the world thinks Britain is full of smart cookies then they are more likely to invest here. In the UK we have many of the finest minds and researchers in the world but in true British tradition we maintain a modest profile, do not reward or recognise sufficiently and often allow discoveries and talent to go overseas. This is also where engineering fails to capitalise, by not exploiting opportunities thrown up by fundamental research (perhaps due to disconnection) and being inept at attracting private funding to develop products, again allowing this to go overseas. In simple terms the RAEng needs to look at and fix its own faults before suggesting others are at fault. Royal clubs for the ‘elite’ should stick to to polo and other blue-sky activities and not try to meddle with taxpayers’ money. Much of particle physics work is carried out at CERN and other overseas facilities and therefore makes a lower contribution to the intellectual infrastructure of the UK compared to other disciplines. Additionally, although particle physics research is important it makes only a modest contribution to the most important challenges facing society today, as compared with engineering and technology where almost all the research is directly or indirectly relevant to wealth creation. What an absurd claim. Surely, no-one who had actually thought about this for more than a second would dispute that the single greatest contribution to the “intellectual infrastructure of the UK” in the last quarter century was the world-wide web. It has also done a huge amount more for wealth creation than anything else I can think of. Remind me: where was the WWW invented? 1) We directly own very little of our intellectual infrastructure, but that does not make it any less important. 2) I was, not unreasonably, measuring economic impact in trillions of dollars rather than its impact on individuals, in which case what is vitally important to fishermen in India does not score very highly. The mobile phone is, however, probably the other candidate for top development for economic impact. Not that it matters much — I’ll settle for second. 3) I am more than happy to make the cultural case for the pure science at CERN. However, thus post was in response to the fallacious argument that we should concentrate funding on engineers who make a large direct economic contribution rather than CERN that doesn’t, by pointing out that CERN has made one of the single largest economic impacts of any organisation anywhere. The fact that the impact is incidental to its core business does not detract from it in any way, but simply underlines that investment in blue skies research may be a better way of getting revolutionary breakthroughs that generate real economic impact than prescriptive directed applied research. I think the state should fund physics and mathematics research precisely because of its “blue sky” nature, not in spite of it. The taxpayer should only be called upon to fund things that can’t be done any other way. Conversely, engineering and technology R&D should instead be funded by the commercial sector precisely because it can yield short-term economic benefits. The decline of the UK’s engineering base has been caused by the failure of British companies to invest sufficiently in research, expecting instead that the Treasury should fund it and all they have to do is cash in later. It’s good to see when the chips are down researchers… turn on each-other. They do make some reasonable points but as you say picking only high yield near future research will kill our competitiveness 5 years down the line by which point all the people who would be current on the next wave of technology will have left…. I thought many of the top physics and mathematics graduates and PhDs were recruited by the city to create risk models and design financial derivatives. Surely, this has to be a good thing. If you had idiots doing it the global financial system could collapse.